Sources say Jill Keimach illegally recorded Councilmembers Jim Oddie and Malia Vella without their consent. 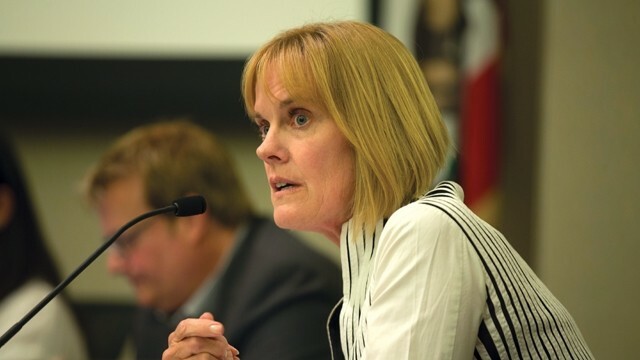 An independent investigator has uncovered evidence that Alameda City Manager Jill Keimach unlawfully recorded two councilmembers and another city employee without their consent last year, according to two knowledgeable sources. Keimach’s alleged actions are the main reason why the Alameda City Council and Mayor Trish Herrera Spencer voted unanimously on March 9 to place Keimach on administrative leave, the sources said. Spencer and the council are scheduled to discuss whether to fire Keimach on Monday night. The existence of the alleged recordings was first learned in early March by independent investigator Michael Jenkins, an attorney who was hired by the council to probe allegations made by Keimach last fall, sources said. Keimach alleged in a letter that unnamed members of the council illegally pressured her to hire the candidate for fire chief backed by the Alameda firefighters’ union. The Alameda City Charter gives the city manager power to hire and fire department heads and prohibits elected city officials from interfering in the process. Although Keimach never named them publicly, the two councilmembers in the meeting were reportedly Jim Oddie and Malia Vella. Police Chief Paul Rolleri also told the East Bay Times last year that Oddie told him that Keimach risked being fired if she didn’t select the right candidate for fire chief. Keimach later selected Ed Rodriguez of the Salinas Fire Department as Alameda’s fire chief — not the firefighters’ favored pick. According to two sources, during the “two-councilmember meeting” in mid-August last year, Keimach recorded Vella and Oddie without their knowledge. California law prohibits the recording of private conversations, known as wiretapping, without the consent of all the people involved. Two sources also said that the recording does not reveal wrongdoing by either Oddie or Vella. They also said Keimach, herself, offered the recordings to Jenkins. It is unclear whether Keimach believed the recordings would bolster her case. However, to underscore the possible illegality of the recordings, Jenkins initially refused to listen to them out of fear of abetting a potential crime, sources said. Jenkins did not immediately respond to a request for comment for this report. Two sources said Keimach also recorded a department manager in a separate recording that the city manager handed over to Jenkins. However, the topic of that conversation apparently was not related to the fire chief. Whether or not the Alameda City Attorney’s Office has reviewed the alleged recordings is also not known. Alameda City Attorney Janet Kern declined to comment Thursday. It’s also unclear whether Kern and the city council will ask the Alameda District Attorney’s Office to investigate Keimach’s actions. Surreptitiously recording private conversations without the consent of another party is a violation of the California penal code punishable by a $2,500 fine per violation and a maximum of one year in jail. An attorney for Keimach denies that she recorded councilmembers without their knowledge. “She is a dedicated public servant. She did nothing wrong,” said Karl Olson, an attorney for Keimach. “She was pressured by councilmembers to give up her power under the city charter to appoint the fire chief. Councilmembers Oddie and Vella wanted the firefighters’ union to control the hiring process of a new fire chief. Vella declined to comment on Thursday. Oddie did not immediately respond to requests for comment. News of Keimach’s alleged actions come days before the Alameda City Council is scheduled to meet in a special closed session meeting on Monday, April 16, at 5 p.m., to discuss the city’s exposure to litigation and a second item that references the potential dismissal of Keimach. The political scandal enveloping Alameda City Hall can be traced to last year when then-Alameda Fire Chief Doug Long indicated to city officials that he would retire later in the year. Keimach then embarked on a search for the city’s next fire chief. As candidates for the position were interviewed and whittled down to a small number of potential choices, the Alameda firefighters union endorsed their own candidate, Domenick Weaver, a 25-year veteran of the department. Keimach eventually tapped Rodriguez to be the city’s fire chief. Keimach made the announcement on Oct. 3, a day after she sent her explosive letter to the council. Meanwhile, days later, Alameda Police Chief Paul Rolleri told a columnist for the East Bay Times that Oddie had communicated to him in August that Keimach’s job was in danger if she did not choose Weaver as the city’s next fire chief. That led the council to hire Jenkins to investigate the allegations Keimach made in her letter. In the months that followed, city officials have been tight-lipped regarding Keimach’s allegations and the investigation. A pair of nearly five-hour special closed sessions since late January on the subject yielded no public information — except for the council’s decision to place Keimach on leave. Updated on April 13 at 9:45 a.m.: Keimach admitted this morning to KCBS radio that she recorded Vella and Oddie without their consent. "I did tape that meeting," Keimach said, adding that she believes the recording proves that Oddie and Vella pressured her in violation of the Alameda City Charter.